Eric works as a land manager and steward for the National Audubon Society, and he is surely a favorite with all visiting the island due to his intimate knowledge of Hog Island and Muscongus Bay and willingness to share with all interested. Unfortunately, he was not too excited about having his photograph taken. I understand. It's not a natural thing for most. ...but he's integral to National Audubon's operations, so I had catch him somehow. Here is my best representation of Eric presenting a geology lesson to the group on a nearby island in the bay. ...not too bad a photo, huh? ...and maybe most appropriate considering Eric. Thanks, Eric, for your stewardship of our shared natural heritage and for helping to make my time on Hog Island fantastic. A candid shot of Audubon staff instructor, Ted, and program participant, Kimberly... Ted's workshop focused on biodiversity in the intertidal, including the smaller, less obvious life found within the water column. This photograph has a group snapshot feel, which falls a bit outside of what I was going for with my project. Still, I believe that it proves to be the most important photograph of the set because it successfully includes Gary, the Trail Crew Superintendent, seen on the far left. 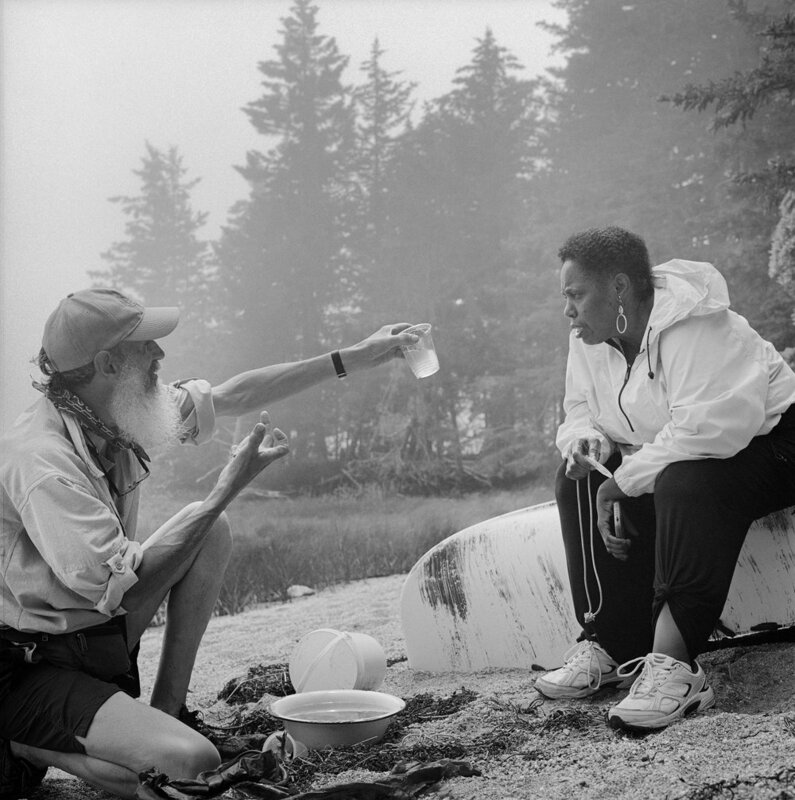 Without question, Gary’s long-term vision for the trail system, funneled through the crew and stewarded over decades, equates to that experience, which for many is Acadia National Park - A near-Zen minimal viewpoint connecting people to nature in a most subtlety Maine way. Stewardship and sense and importance of place equate to a relevant chain of history... It seems so obvious to me now, but had not completely occurred to mind until shown via granite, chisel, wood, dirt, rock bar, muscle, never-ending drive, smarts, and ingenuity. Thank you Gary and the Acadia trail crew for all that you do to protect and share this bit of our natural heritage. We are all in your debt. Heather, I can say without hesitation, is the best. 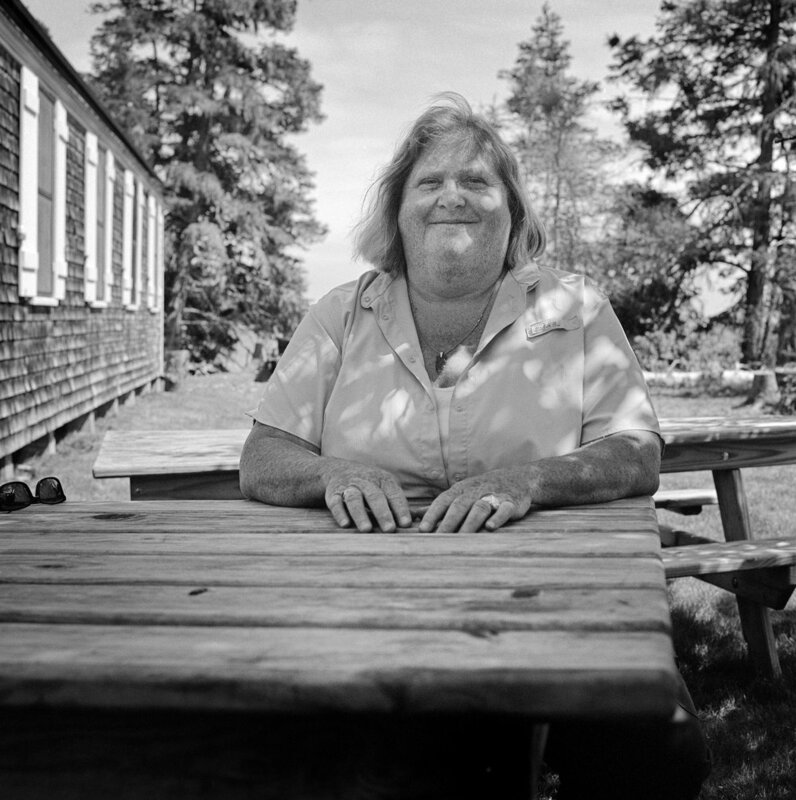 She plays an administrative role for the trails crew in Acadia National Park, keeping all of the field season chaos corralled. Her attention and help during my residency proved invaluable, introducing me to everyone (literally) and making sure I had room to bring as much inclusiveness as possible into my project. We checked in near daily where she aligned me to crew locations and who I should first look for once I arrived onsite. She also upfront keyed me into some worksite expectations and crew culture. Let’s just say that when working with Heather (and the crew overall) a bit of sarcasm, friendly ribbing, and levity go in hand with a hearty chuckle and true assistance and guidance. It would be difficult not like Heather because she is one hundred percent engaged in supporting the team and also attached to each colleague personally. …and just fundamentally thoughtful and kind, which makes a combination that’s magic to be around and work with. Thank you, Heather, for helping make my experience with the crew and at Acadia happen. It means much and more than you know. Respect. 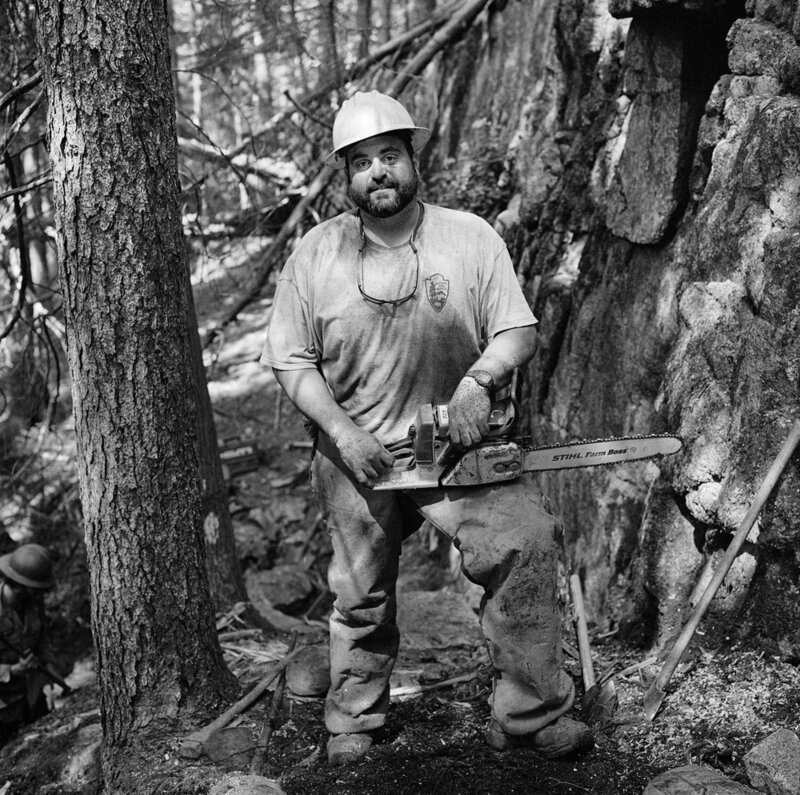 Chris brilliantly serves as a supervisor for the Acadia Trail Crew. Our paths crisscrossed as I made my way between the various group trail projects, and each time we overlapped, he took time to check in to be sure I was ok, and most notably to ask what I’d seen or experienced in the park. On the worksite, he appeared all business, setting up the crews with high wire lines for moving rocks and lining out pathway end course with orange forestry flagging, taking into account visitor experience, ecological integrity, and overall work efficacy for the crew. Near the end of my time in Acadia, Chris and I had lunch together sitting on flat rocks in a dry stream bed along the Deer Brook Trail. We primarily talked about school, art, and the environment, which most genuinely lead to Chris sharing that he likes to write poetry as much as trail building. I’m guessing that both connect to place, people, and nature, which seems perfect from many angles. Humble, genuine and real, this is Chris. I learned this winter that he is serving as Acadia National Park’s first poet laureate throughout 2016, the centennial year for the park and the National Park Service. Yes, perfect. Congratulations, Chris! "All labor that uplifts humanity has dignity and importance and should be undertaken with painstaking excellence." ~Martin Luther King, Jr. I first ran into Christa on the Deer Book Trail. She was working with the Youth Conservation Corps filling in some tread with crushed rock and gravel just above a newly built wooden staircase. It seemed, though, that wherever I turned in the park, I would run into her. …and in each place we crossed paths, she’d smile, quickly say hello, and quietly continue with her project. I noted that Christa was an important teacher with the Youth Corps and ultimately with all of my questions. She’d bring one to a given spot to show firsthand example to accompany her explanation and also encourage getting hands dirty and ultimate comprehension through trial. Brilliant! …and while my overall understanding remains basic, I have a better grasp of trail building and maintenance thanks to Chirsta (and all the crew at Acadia). When talking about Christa with the Trails Crew Superintendent he said, “Christa is usually the “quiet type” but don’t be fooled by that. She’s excellent asset to the team who shows independence, great work ethic and diligence.” I know Christa would be a bit embarrassed by this praise, but representing the crew member archetype, I think it’s important to highlight. The decency of hard work is evident through Christa. …and when leveraged through similar group effort, special things happen. Go, Christa, go!